The biggest SUV in its class! 7 passenger seats in a huge comfortable lounge. The Nissan Patrol has a powerful V8 engine and despite the dimensions and weight of the car it accelerates to 100 in 5 seconds. SUV in everything: high ground clearance, a powerful engine and a customizable all-wheel drive. Nissan Patrol is the most popular and recognizable car. 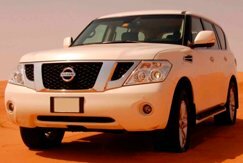 Rent Nissan Patrol in Dubai at an affordable price.